A full range of meat products including custom cuts are available for our customers. 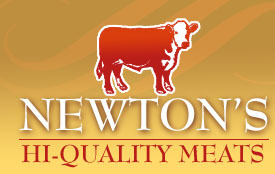 Customers are offered a plentiful selection of premium Grade A/AA/AAA Canadian Beef at very competitive prices delivered to their door via a fleet of refrigerated delivery vehicles owned and operated by Newton Hi Quality Meats. Everything from succulent roasts to tender juicy steaks, hearty stews and mouth watering patties, each product is sure bet to tickle the taste buds. A wide variety of imported beef cuts are also available. A full line of New Zealand, Australian and as of recently Uruguay Beef products is offered upon availability. Other than standard cuts of beef, Newton's also offers the ability to provide customized cuts due to the extensive experience of the in-house cutting operation. 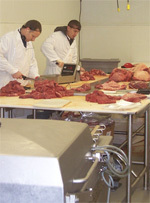 A team of trained meat cutters work full time to fulfill custom orders and elevate customer satisfaction while reducing costs to the customer by processing larger volumes of product. Some of the most common brands carried by Newton's are IBP/Lakeside, Cargill, Excel, XL. We also carry halal beef from New Zealand. The extensive beef line is complemented by a selection of premium veal cuts both fresh and frozen. Canadian as well as imported veal is offered at a value price to the customers. Some of the more popular veal cuts requested by the customers include Top Rounds, Chucks, Stew, Cutlets and ground veal to name a few. An extensive line of fresh and frozen pork produced locally and imported from Denmark and Finland are available. Along with the standard cuts such as butts, loins, ribs, tenders and a wide selection of hams, Newton's can also accommodate requests for whole hogs, sides of pork, bacon and a variety of sausages. 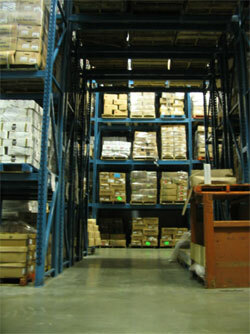 Only the finest quality product offering exceptional value is offered to our customers. Lamb inventories comprised of fresh and frozen lamb from Canada, Australia and New Zealand are available for immediate shipping. A full line of shoulders, legs, shanks, loins and racks are available in bone-in, boneless, fresh as well as frozen states. Prices are extremely competitive. All our New Zealand Lamb is Halal; verifiable by a halal stamp from the packing house. We also carry fresh lamb legs, loins and racks from Australia. Whole carcass of lamb (Frozen & Fresh) along with frozen goat carcass complement this line of product. 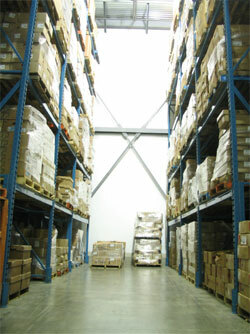 A full line of all poultry cuts, fresh and frozen are offered for immediate delivery. Maple Leaf Poultry is the chief supplier of fresh poultry including wings, whole fryers, legs, thighs, drumsticks, breast etc. Some of the frozen poultry items include chicken strips, wings, diced chicken, various sizes of frozen portion-sized boneless skinless breasts and some deli cuts as well. Poultry line is rounded off by frozen turkey offerings that include whole turkey, deli cuts and turkey sausage amongst other items. Along with meat products, Newton's also offers a variety of oils, margarines, seafood items, specialty sausages prepared on-site, cheese and deli cuts. 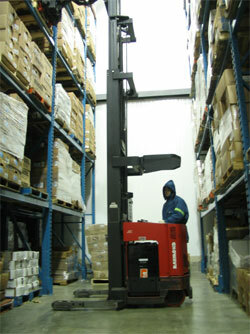 Care is taken to ensure the products are of highest quality and meet or exceed the expectations of the customers.